Crystal Palace pulled off a stunning extra-time victory at Old Trafford to reach the Carling Cup semi-finals and send Manchester United crashing out. 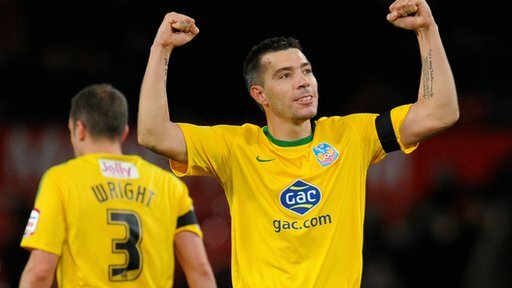 After a dull first half, Palace substitute Darren Ambrose thundered a 35-yard drive into the top corner. United were on level terms four minutes later when Federico Macheda won and scored a penalty. Glenn Murray headed in from a free-kick to put Palace ahead and they weathered a late storm to reach the last four. United will point to the fact that Murray was marginally offside when the free-kick was taken, but the win was little more than the Championship club deserved after they refused to be overawed by their illustrious opponents. Indeed, despite making 10 changes to the side that drew with Newcastle on Saturday, United boss Sir Alex Ferguson still picked eight full internationals and will have been shocked to see how badly his players coped with Palace's energy and purpose. The south Londoners made a mockery of their dismal recent league form - they had not scored in their previous five games - by tearing into United from the first whistle, with their exciting 19-year-old Wilfried Zaha leading the charge. The Ivory Coast-born winger had an appeal for a penalty turned down when he raced in behind the United defence and tumbled under a challenge from Fabio. Replays suggested a foul should have been given, but that the contact between the players was outside the penalty area. Clearly unsettled by Palace's electric start, United took time to settle into a passing rhythm and it took a mazy run from Antonio Valencia to fashion their first opening. The Ecuadorian wideman teed up Dimitar Berbatov, but the striker - soon to be hauled off at half-time -screwed his shot wide. United stayed on the back foot for most of the remainder of the half, with Palace dominating possession and territory. Zaha continued to represent Palace's biggest threat, turning Jonny Evans to work himself some space, but driving his shot over the bar. United should have taken the lead five minutes after the break when Valencia nicked the ball off Palace centre-back Anthony Gardner and bore down on goal, but pulled his shot past the post. Then substitute Ravel Morrison twice forced Palace goalkeeper Lewis Price into sharp saves as United upped the ante. Palace's goal came totally against the run of play but was stunning in quality and execution. Picking up the ball just inside the United half, Ambrose surged forward before unleashing an unstoppable shot which swerved dramatically as it flew into the net. Palace's lead was short-lived as Patrick McCarthy clumsily pulled Macheda to the ground and the Italian sent goalkeeper Lewis Price the wrong way from the spot. As the game drifted towards extra-time, Murray had the best opportunity to break the deadlock, but he fired into the side-netting from a difficult angle. Eight minutes into extra-time, Murray made amends for his profligacy in sensational fashion as he escaped his marker Evans to nod Ambrose's free-kick home past goalkeeper Ben Amos. The goal was the cue for a United onslaught, with both Macheda and Valencia going close, but some heroic defending saw Palace into the last four for the first time in 10 years. 120:00+0:30 The match has ended. 119:52 The ball is crossed by Antonio Valencia, save made by Lewis Price. 119:11 Centre by Antonio Valencia, clearance made by Nathaniel Clyne. 117:52 The ball is crossed by Antonio Valencia, Mame Diouf takes a shot. Patrick McCarthy gets a block in. 115:41 Drilled right-footed shot by Darron Gibson. Blocked by Kagisho Dikgacoi. 114:57 The ball is swung over by Antonio Valencia, clearance made by Patrick McCarthy. 112:20 Chris Smalling produces a cross. 111:12 Free kick awarded for an unfair challenge on Patrick McCarthy by Ji-Sung Park. Lewis Price takes the direct free kick. 109:42 Booking Darron Gibson is given a yellow card. 109:37 Foul by Darron Gibson on Glenn Murray, free kick awarded. Direct free kick taken by Anthony Gardner. 107:05 Glenn Murray fouled by Jonathan Evans, the ref awards a free kick. Patrick McCarthy restarts play with the free kick. 106:50 The ball is swung over by Antonio Valencia, blocked by Patrick McCarthy. 106:20 Effort from just outside the area by Glenn Murray goes over the target. 105:12 Chris Smalling delivers the ball, save by Lewis Price. 104:27 Effort from long distance by Paul Pogba goes wide right of the goal. 104:04 Federico Macheda delivers the ball, blocked by Darren Ambrose. 102:18 Ji-Sung Park produces a cross, blocked by Jonathan Parr. 101:51 A cross is delivered by Ji-Sung Park, David Wright makes a clearance. 101:01 The official flags Glenn Murray offside. Ben Amos takes the indirect free kick. 100:20 Chris Smalling gives away a free kick for an unfair challenge on Glenn Murray. Darren Ambrose has a direct shot on goal from the free kick, Ben Amos makes a save. 99:53 Federico Macheda produces a right-footed shot from deep inside the penalty box which goes wide of the left-hand upright. 99:10 Shot from outside the area by Darron Gibson misses to the left of the goal. 98:42 Corner from the left by-line taken by Paul Pogba, Anthony Gardner manages to make a clearance. 97:27 Assist by Darren Ambrose. 97:27 GOAL - Glenn Murray:Man Utd 1 - 2 Crystal Palace Glenn Murray finds the net with a headed goal from close in. Man Utd 1-2 Crystal Palace. 96:01 Outswinging corner taken by Antonio Valencia from the right by-line, clearance by Nathaniel Clyne. 95:50 Shot by Antonio Valencia. Blocked by Patrick McCarthy. 94:49 Inswinging corner taken from the left by-line by Darron Gibson. 94:24 Shot by Darron Gibson. Blocked by David Wright. 92:17 A cross is delivered by Nathaniel Clyne, clearance made by Chris Smalling. 91:59 Nathaniel Clyne produces a cross, Chris Smalling gets a block in. 91:01 Ji-Sung Park produces a left-footed shot from just outside the box that misses to the right of the target. 90:00+3:29 The whistle goes to signal the end of normal time, with extra time looming. 90:00+2:33 Shot by Wilfried Zaha. Comfortable save by Ben Amos. 90:00+0:20 Short corner taken by Wilfried Zaha. 89:25 Effort from outside the area by Glenn Murray goes wide right of the goal. 88:30 Ravel Morrison has a shot on goal from outside the box which misses left. 87:29 Unfair challenge on Chris Smalling by Glenn Murray results in a free kick. Free kick taken by Ben Amos. 87:07 The referee blows for offside. Indirect free kick taken by Patrick McCarthy. 85:28 Free kick awarded for an unfair challenge on Jonathan Evans by Glenn Murray. Direct free kick taken by Chris Smalling. 85:04 Shot by Darren Ambrose. Chris Smalling gets a block in. 84:04 Free kick awarded for an unfair challenge on Paul Pogba by Stuart O'Keefe. Direct free kick taken by Darron Gibson. 83:16 Darren Ambrose takes a inswinging corner from the left by-line to the near post, clearance made by Jonathan Evans. 83:02 The ball is swung over by Wilfried Zaha. 82:30 Darren Ambrose takes a inswinging corner to the near post, Paul Pogba makes a clearance. 81:45 Free kick awarded for an unfair challenge on Antonio Valencia by Wilfried Zaha. Direct free kick taken by Antonio Valencia. 81:09 The ball is sent over by Wilfried Zaha. 79:50 Kagisho Dikgacoi concedes a free kick for a foul on Darron Gibson. Darron Gibson restarts play with the free kick. 79:11 The referee blows for offside against Mame Diouf. Indirect free kick taken by Lewis Price. 78:35 A cross is delivered by Ji-Sung Park, clearance made by Kagisho Dikgacoi. 77:46 David Wright concedes a free kick for a foul on Ji-Sung Park. Free kick taken by Ji-Sung Park. 76:31 Shot from 18 yards by Mame Diouf. 73:15 Substitution Jermaine Easter leaves the field to be replaced by Glenn Murray. 71:37 Jonathan Parr sends in a cross, comfortable save by Ben Amos. 70:43 A cross is delivered by Jonathan Parr. 69:07 Unfair challenge on Jonathan Parr by Antonio Valencia results in a free kick. Lewis Price takes the direct free kick. 68:03 GOAL - Federico Macheda:Man Utd 1 - 1 Crystal Palace Placed penalty scored by Federico Macheda. Man Utd 1-1 Crystal Palace. 67:15 Penalty awarded for an unfair challenge on Federico Macheda by Patrick McCarthy. 65:58 Effort on goal by Paul Pogba from outside the area goes harmlessly over the bar. 64:30 The assist for the goal came from Wilfried Zaha. 64:30 GOAL - Darren Ambrose:Man Utd 0 - 1 Crystal Palace Darren Ambrose scores from 35 yards to to the top left corner of the goal. Man Utd 0-1 Crystal Palace. 64:07 Foul by Stuart O'Keefe on Darron Gibson, free kick awarded. Free kick taken by Darron Gibson. 63:12 Substitution Paul Pogba on for Rafael Da Silva. 61:42 Federico Macheda has an effort from just inside the box that misses to the left of the target. 59:22 Shot by Ravel Morrison. Save by Lewis Price. 57:08 Free kick awarded for an unfair challenge on Jonathan Parr by Antonio Valencia. Lewis Price restarts play with the free kick. 56:43 Rafael Da Silva produces a cross. 54:06 The official flags Federico Macheda offside. Patrick McCarthy takes the direct free kick. 53:23 Shot from 20 yards from Ravel Morrison. Save made by Lewis Price. 52:41 Foul by Stuart O'Keefe on Antonio Valencia, free kick awarded. Ji-Sung Park takes the free kick. 51:16 Antonio Valencia produces a drilled right-footed shot from deep inside the penalty area which goes wide of the left-hand post. 49:21 Free kick awarded for a foul by Jonathan Parr on Ji-Sung Park. Free kick crossed by Darron Gibson. 48:44 Shot by Darron Gibson from deep inside the penalty area misses to the right of the target. 46:54 Darron Gibson concedes a free kick for a foul on Kagisho Dikgacoi. Lewis Price restarts play with the free kick. 45:01 Substitution Darren Ambrose replaces Dean Moxey. 45:01 Substitution Ravel Morrison comes on in place of Dimitar Berbatov. 45:00+2:40 It is the end of the first-half. 45:00+1:20 Centre by Ezekiel Fryers, save by Lewis Price. 45:00+0:25 Free kick awarded for an unfair challenge on Dean Moxey by Federico Macheda. Dean Moxey restarts play with the free kick. 44:13 Substitution Jonathan Parr comes on in place of Sean Scannell. 43:20 Mame Diouf produces a right-footed shot from inside the area that clears the crossbar. 40:50 Handball decision goes against Federico Macheda. Lewis Price takes the free kick. 38:14 Ezekiel Fryers produces a cross. 36:16 Substitution Ezekiel Fryers on for Fabio Da Silva. 35:54 Kagisho Dikgacoi has an effort at goal from outside the box which goes wide left of the goal. 34:48 Foul by Federico Macheda on Nathaniel Clyne, free kick awarded. David Wright takes the direct free kick. 28:50 Booking The referee shows Fabio Da Silva a yellow card for unsporting behaviour. 28:45 Fabio Da Silva challenges Wilfried Zaha unfairly and gives away a free kick. Lewis Price restarts play with the free kick. 27:46 Centre by Rafael Da Silva. 26:46 Nathaniel Clyne fouled by Federico Macheda, the ref awards a free kick. Direct free kick taken by Nathaniel Clyne. 24:59 Wilfried Zaha gives away a free kick for an unfair challenge on Fabio Da Silva. Free kick taken by Ben Amos. 24:48 Wilfried Zaha decides to take a short corner. 24:38 Sean Scannell produces a drilled right-footed shot from 18 yards. Blocked by Jonathan Evans. 23:41 Antonio Valencia delivers the ball, blocked by Dean Moxey. 22:19 Foul by Dimitar Berbatov on Patrick McCarthy, free kick awarded. Lewis Price takes the free kick. 22:01 Free kick awarded for a foul by Stuart O'Keefe on Ji-Sung Park. Darron Gibson takes the direct free kick. 20:43 Wilfried Zaha produces a right-footed shot from inside the area that clears the bar. 19:15 Effort on goal by Dimitar Berbatov from inside the penalty box misses to the right of the target. 18:13 Corner taken right-footed by Darron Gibson, Dimitar Berbatov takes a shot. Lewis Price makes a save. 17:55 Darron Gibson has a drilled shot. Blocked by David Wright. 16:46 Unfair challenge on Wilfried Zaha by Darron Gibson results in a free kick. Direct free kick taken by Patrick McCarthy. 13:55 Fabio Da Silva challenges Wilfried Zaha unfairly and gives away a free kick. Anthony Gardner takes the direct free kick. 8:05 Rafael Da Silva has an effort at goal from outside the penalty box missing to the wide right of the goal. 7:37 Corner taken right-footed by Darron Gibson. 4:50 Sean Scannell takes a short corner. 1:08 Shot from just outside the area by Wilfried Zaha goes over the bar. 0:55 The ball is swung over by Rafael Da Silva, clearance by Nathaniel Clyne. 0:24 Darron Gibson takes the outswinging corner, clearance by David Wright.